Whether you are visiting Maine for the first time or whether it has been awhile since your last visit, it's always a good idea to brush up on a few things you should know about a few Maine laws that might affect you. • For road and travel conditions, call 511 or (866) 282-7578. • Seat belts are required for all ages. • Children weighing less than 40 pounds must be secured in an approved child safety seat. Children younger than 8 and weighing 40-79 pounds must be secured in an approved child booster seat. Children under 12 weighing less than 100 pounds must be secured in the back seat of a vehicle whenever possible if the vehicle has a front-seat, passenger-side airbag. • Headlights must be in use when the windshield wipers are in use. • Right turn on red permissible, unless otherwise noted. • Open containers of alcohol are prohibited in motor vehicles. • For motorists 21 or older, driving with a blood-alcohol content of 0.08 percent or above is illegal. • For motorists under 21, driving with a blood-alcohol content above 0.00 percent is illegal. The Maine Tourism Association operates visitors centers on I-95 north- (Mile 169) and southbound (Mile 172) in Hampden. • For commercial motorists, driving with a blood-alcohol of 0.04 percent or above is illegal. • Motorcyclists under the age of 15 must wear an approved helmet. • Bicyclists and passengers in a bicycle seat or trailer who are under the age of 16 must wear a bicycle helmet. • You may enter the state with a maximum of 1 gallon of whiskey, 1 gallon of spirits -- wine or liquor -- and one case of beer. • Radar detectors and mobile radio scanners are legal. • Speeding fines double in all work zones. • Motor vehicle crashes that result in damge of at least $1,000, death or personal injury must be reported immediately to local police, the county sheriff or state police. • In case of an emergency, you can call the Maine State Police on your cellular phone by dialing 911. • Smoking is prohibited in restaurants, bars and in buildings open to the public. • Fireworks are illegal, except for sparklers and caps. 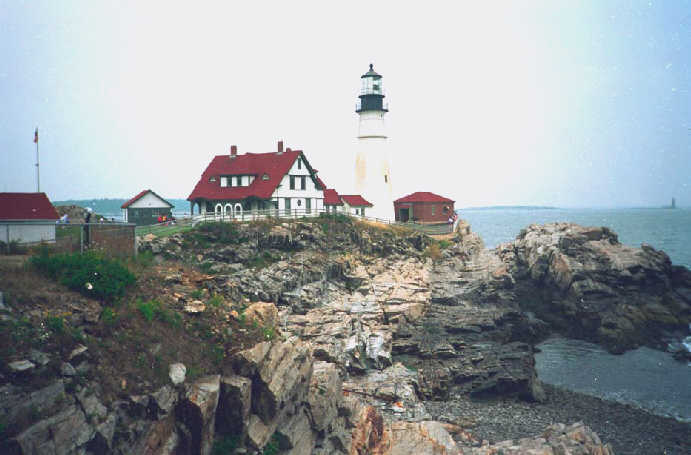 Portland Head Light photo © 2000, Ryan R. Robbins. All rights reserved. © 1995-2012, Ryan R. Robbins. All rights reserved.